I had a horrible sensation in my stomach only because, like, a billion things could go wrong when you try to tell a girl that her Eighties-flavoured boyfriend from a past life was trying to hook back up with her.Preloved is the story of 16-year-old Amy Lee, a girl who lives in the fictional Australian town of Middlemore with her Chinese mother. On her school’s Eighties Theme Day, she’s dressed up as Buttercup from The Princess Bride and battling her love/hate relationship with her best friend Rebecca when she accidentally stumbles upon a silver locket with a picture of a boy from the 80s inside. Her life gets complicated when the boy’s ghost appears and begins to haunt her–but not for the usual reasons you might expect. First of all, Logan wears his collar popped. And he’s persistent. And he’s annoying. But as Amy grows closer to her ghostly companion, her heart begins to yearn for the things it cannot have. Because Amy wasn’t meant to pick up the locket at all…Rebecca was. Distilling the essence of what this book is about doesn’t even begin to hint at the reading experience, however. Written with fast and funny prose that is bubbling over with good humor, this is a ghost story that doesn’t happen to be scary and a love story that doesn’t happen to be about dating. Amy has a lot going on in her life even before Logan appears, since she feels overshadowed by nearly everyone in her life, even though she deals with it with amusing offhandedness. She describes herself as Rebecca’s “short, awkward, Asian best friend. Which did have its advantages, because everyone instantly believed I was O-Ren Ishii from Kill Bill, with martial arts skills.” She’s also trying to figure out who she is, since she doesn’t quite fit in with the nerdy Asian kids at school, but also chafes at her mother’s superstitious adages and old-fashioned beliefs. 80s pop culture references that it will be interesting to see if most 13 – 18 year olds will respond to that. I would love to see the author delve a little more into emotional themes in her next novel, however. There are so many flashes of deep feeling in Fury and we skate around the edges of some serious emotions in Preloved, but I’m convinced there are even more depths to be plumbed that the author hasn’t shown us quite yet. There is an appealing sweetness and sadness in Amy and in this book, and there is also an additional love story that I didn’t expect–specifically, the one between Amy and her mom, which is actually my favorite part of the story. I’ve known a lot of Asian mothers and the loving exasperation with which Amy deals with her rings very true. What may seem a bit of an exaggerated cultural aricature isn’t really exaggerated at all, nor are the occasional emotional blackmail, Amy’s consciousness of her potential unladylike behavior, her expectations for her daughter, etc. It’s a pleasure to see the wry closeness between the two of them, as well as how the relationship changes and develops as the two of them learn more about each other. I thought about Mum’s vintage shop. How she believed that if she found something broken and lovingly put it back together, that someone would come along and love it again. This review also appears on GoodReads. An advance copy was provided by the publisher. Recommended for fans of Meg Cabot’s Mediator series, Babe in Boyland, Geek High, Pink, So Over You, and for younger YA readers. This Aussie YA title is available in Australia and New Zealand, as well as through Fishpond.com. 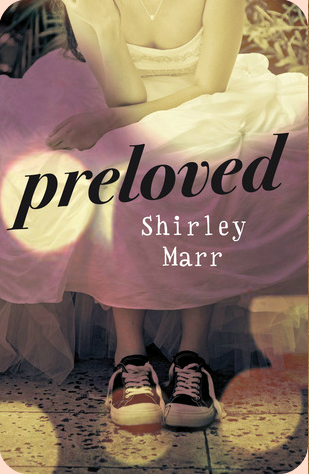 Check back with us next week, however, because Shirley Marr is stopping by as part of the Preloved Blog Tour! We have an autographed copy of the book as well as a beautiful prize for one of our lucky readers. This is the loveliest item we’ve ever given away and one that ties in directly with the book, so be sure not to miss it. 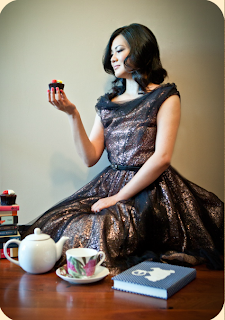 Check out my Preloved Inspiration Board on Pinterest, too! It might give you a little feel for the mood of the book. I was very intrigued when I read about a popular Australian snack that Amy likes to munch while she’s watching The Princess Bride: popcorn with icing sugar! After much discussion with my GoodReads pals, especially the helpful Taneika from Flipping Through Pages, I decided to make a batch, except I thought it’d be fun to make the the popcorn pink and give it a little subtle flavor as well. Since Amy drinks strawberry milk in the story, it seemed like a no-brainer to make strawberry popcorn. Ummm, seriously, I’m loving this book already, especially the kind of… it seems like Amy kind of thinks she’s playing a supporting role in her life… but even from the little you’ve quoted, she sounds so vibrannt, quirky, and wonderful. Ummm… seriously, I need to stop writing comments until I’ve read all the way through (I’m writing as I read), because I wrote THAT ^, and then read the “I see you…” quote! Hehe! I really need to read this book soon! I haven’t read any books by Shirley Marr but I know that she is an Aussie author! I definitely need to read her books! And aww, I love that popcorn image! 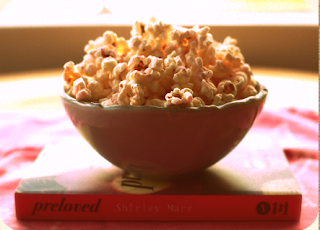 It sounds like a perfect snack while reading Preloved! Oh, I hope you do give both a try sometime, Misa! Fun fun fun all around. :) Thanks for stopping by! I think you’d enjoy Shirley’s writing style, Heidi. Did you ever get yourself a copy of FURY? If not, I’m still touring it, so let me know if you’d like to borrow it! Any author who references the 80s and Kill Bill in one book is probably an author I’m going to love. I’ve wanted to get my hands on Shirley Marr since I saw Fury last year, hurray for Fishpond! This sounds like so much fun, a good twist on some things we’ve seen before. And that popcorn looks delicious (and matches! ), I may try it tonight. I haven’t heard of this book before. However, after reading your decription of Preloved I can’t wait to read it. It sounds amazing. I love The Princess Bride- so right away I am intrigued. Wendy, I’ve heard really good things about Marr’s Fury so this one sounds pretty different from it. The YA genre seems to lack characters that aren’t Caucasian so I’ll be adding this one to my wishlist. I’m a big fan of Shirley’s work–I hope you get a chance to check out FURY sometime, Z. I agree, it’s always good to see POC depicted in YA, especially when it’s not the primary focal point of the story, as those can get a little tiresome. ;) This one’s very sweet! I’ve never had popcorn that way, but it sounds yummy! Maybe I’ll try it next time I get the munchies…lol. Just be prepared to inhale a whole bunch of it, Nat. ;) I don’t know whether it’s because the flavor is more subtle with the powdered sugar, but it was hard to stop eating it! Hah hah, I thought that was a really fun quote as well. I had to stop myself from posting more, actually, there were so many amusing lines throughout the book! Shirley’s really fun to follow/friend on GoodReads, Rachel–she’s totally friendly and approachable, and I’m sure she’d love to be pals if you reach out to her. :) Not to mention she actually READS. Oh fellow child of the 80s, welcome to Shirley’s orbit! She’s great fun to read. :) Even without strawberry popcorn. I probably won’t end up reading Preloved, since you say it’s more for a younger YA audience, but the story is intriguing. Love the idea of the ’80s ghost and that the locket was actually meant for her love/hate friend. Well.. maybe I’ll read it. I’ll definitely have to check out Fury though. P.S. The popcorn sounds delicious, especially your strawberry kind! I’ll have to try out the recipe sometime for sure. The book did have a sort of younger, more innocent feeling to me, Linny, but that’s not to say that older readers won’t love it, too. I am a big fan of FURY, I hope you have a chance to read both sometime! Great review, Wendy! I’m so glad you enjoyed this too! 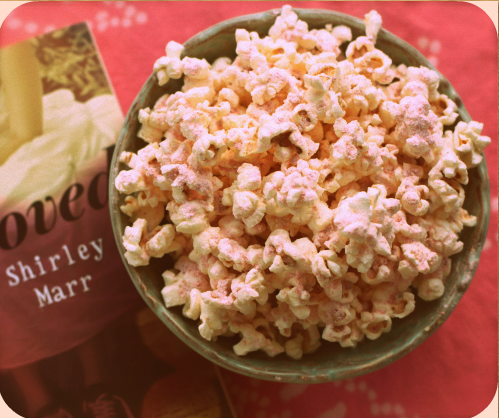 The pink popcorn is gorgeous, Wendy :) I’ll have to give that a try! Thanks for the review, I’m definitely looking forward to this this then cause I really liked the Mediator series when I read it a couple years back. The Mediator series came to mind because they’re similarly fun, lighthearted books with a boy ghost. :) I hope you enjoy this one too, Lynn! Great Review Wendy! I will definitely be checking this out (along with Fury). At first when you mentioned the sugared popcorn I was like the other Australians: WAH?! but then I remembered as a kid I actually had had it at parties and you could buy them in different colours which were pink, green and yellow at the shops. I myself was born in the 90’s and I am 18 now but I do know a bit about the 80’s since I love their music over current music. I have also watched several 80’s movies including the Princess Bride. But I am an exception to my generation I guess since I know most people in that age group most likely won’t get it and sadly won’t care which is a shame because I kind of sometimes wish I was able to have been born in the 80’s although I still love been a 90’s kid. Thanks Zoe! I wish I’d had a childhood filled with sugar-dusted popcorn. ;) I’m really curious what you’ll think of this one–please let me know if you enjoy it when you get around to reading it! this sounds really cute!! not sure if it’s out in the US, but if it is I’ll try to get my hands on it! I know, the combination of all those things is too good to pass up! FURY is back on Fishpond.com, Sam, if that helps at all–I guess they’ve restocked since we cleaned them out last time, hah. I’m simply itching for pink popcorn! I hadn’t heard of this one yet and I totally am DYING to read it now! It sounds pretty freaking awesome cause I love stories with ghosts! Definitely adding this to my wish list! Really fantastic review. Between your review and the gorgeous quotes sprinkled throughout, I really, really have to read this. Not only do I love the quiet, humorous tone that it seems to have, but: family relationships! I absolutely adore seeing a family relationship be a real part of the plot, so I would read this book for that alone. I am such a fan of Shirley’s writing, especially her characterizations and humor. And yes, the family relationship is extremely important to the book, in a way that surprised me, in a very good way. I hope you get to read it soon, Lexie! Oh, this book is stuffed with 80s references, Savannah. :) If you’re a fanatic, that’s something you’ll probably have a great time with! Heeee. I think we need to come up with a mix tape/play list for this book! There are definitely plenty of suggestions in the story. I think you’d enjoy this one too, Mimi, it’s adorable. That recipe card is tooo cute and inspires me to eat more popcorn, so I love it! Thanks Missie! It’s not really that much of a “recipe,” hah, but I thought it was a fun little thing to offer up anyway. :) Anything that inspires more popcorn-eating is always good. Ghost, the 80’s, Chinese culture, set in Australia, and all while eating pink-powdered popcorn, I’m in. Sounds like such a fun story! Yay, I’m glad this fits your checklist! It’s a super fun book, Betsy, I hope you get a chance to read it soon. :) Thanks for stopping by! what a beautiful review! The cover is really fun, I confess I didn’t know it (yes again, well you always make me discover new books) but it sounds like nice story. I really need to read more novels like that. What a beautiful review. I love the Princess Bride and I *cough* graduated int he 80’s so I will probably have a lot to relate to lol. Hah hah, I was just talking to some friends on my GoodRead review about how depressing it is that this book is written for readers who weren’t even around during that time. *sigh* Let’s just say I enjoyed the trip down memory lane, too. I need to read something by this author! I heard such good things about Fury, and this one sounds great as well. And based on those few snippets you posted, her writing is beautiful:) Thanks for putting this one on my radar Wendy! Oh Jenny–I would dearly love to loan you my copy of FURY. I think you’d like the prickly, defensive, murderous Eliza. I have to remember to send you a PM to see if you’d be interested in borrowing it, I have a couple of books that are touring right now. I am so in love w/the premise of Preloved. You had me at The Princess Bride and 80’s pop culture. I’m glad you enjoyed this one, despite it not bring as in-depth as Fury. I am definitely adding Prelived to my TBR. Aw, in love with Preloved! I’m glad it’s on your radar, Andrea. This is a smaller publisher and a book that’s a little harder to get, so I’m always really happy when a fellow blogger considers picking it up. :) Hope you enjoy it when you get around to it! Awesome review!! The Princess Bride is one of my favorite movies!! I watch it probably once a month. I love the 80’s too, so this book sounds really great to me. I totally want to read this book now!! It’s really unusual to see Asian mother/daughter portrayed in an accurate way that still manages to come across as loving, you know? I’d love to hear what you think of this one if you read it. I have such a sweet tooth (okay, and a salty tooth too) that I knew I had to try out that snack immediately! Oooohh I spy an Aussie book :) This looks like a fantastic read! Ghosts and the 80’s culture has always intrigued me, so I’m looking forward to reading this! I’m so glad you enjoyed it, Wendy! Hee, this did turn out to be two Aussie books in a row for us on the blog! And okay, I thought it was a popular Aussie snack because at least FOUR people chimed in saying “Omg, you must try it!” when I posted a status update. But I’ve now heard from a few Aussies saying “…what?” too, hah. Princess Bride is one of my favorites too, Jeannette! I could watch that movie over and over again (and I have) without ever getting tired of it. I think you’d like this one, it’s very cute. :) Thanks for stopping by! I am VERY lucky to have a copy of this. :) Thanks so much, Jasprit, hope you enjoy book and popcorn when you get around to it!